Lucas Euser wants to wear a black cowboy hat more than anything right now. It’s not for shade or to keep the rain off his head. Donning it would mean he’s the overall leader of the ongoing Larry H. Miller Tour of Utah. Now that he’s third on GC after today’s Stage 3, the Stetson hovers tantalizingly just out of reach. The UnitedHealthcare Pro Cycling Team rider ascended the last challenge of the day, cat 1 Mount Nebo, in the chase group to land third place in a select sprint behind winner and new yellow jersey Lachlan Morton (Garmin-Sharp). That effort moved Euser thirty-three places up in GC to where just 40 seconds separates him from Morton and that hat. 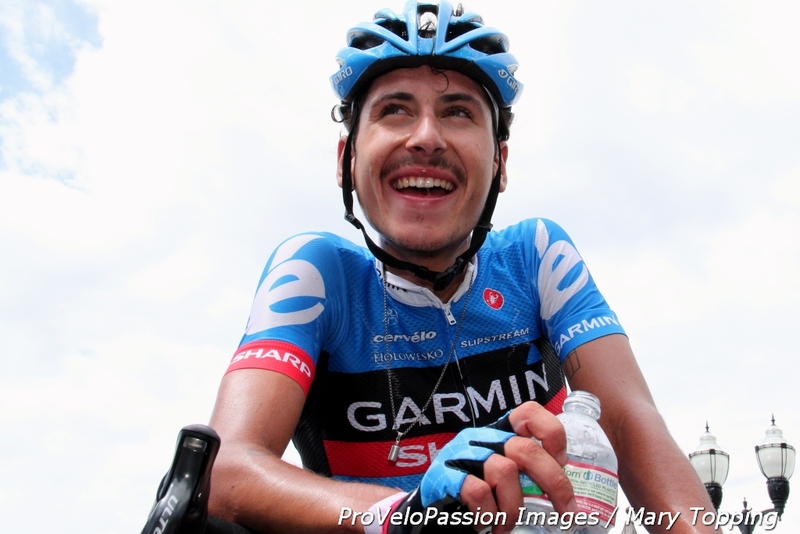 In May Euser finished third on the uphill finish Mogollon Tour of the Gila stage. 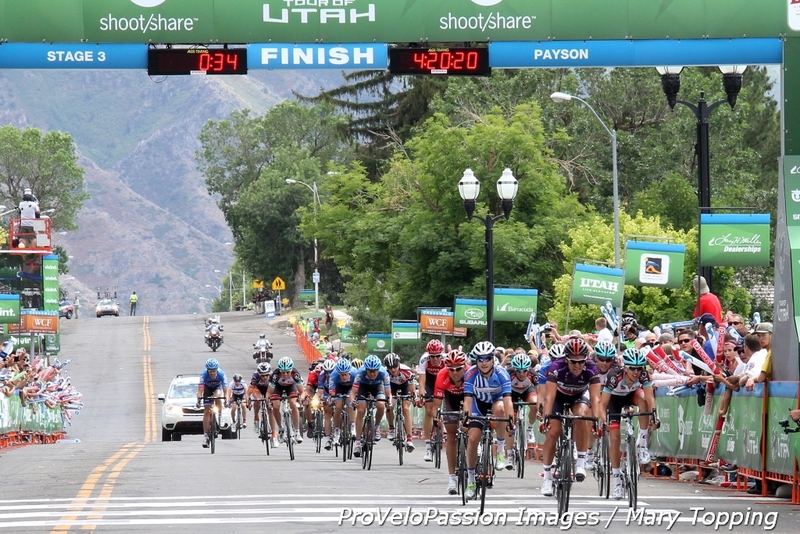 Last year in Utah he placed in the top ten overall and then rode aggressively at the USA Pro Challenge. He’d like to spray champagne from the final podium when this year’s Tour of Utah concludes on Sunday in Park City. The fifteen guys lined up behind him within four seconds of his time would love to get their hands on the same hat, not to mention Janier Acevedo (Jamis-Hagens Berman) who lurks another thirty seconds down in nineteenth place. The group includes guys who can fly uphill on the tour’s two final decisive days – Chris Horner, Matthew Busche, and George Bennett on RadioShack-Leopard; Tom Danielson and Peter Stetina on Garmin-Sharp; and Euser’s teammate Philip Deignan. If Euser wore a virtual hat this afternoon, it would be white. He expressed admiration for Morton’s results even though he started the day thinking he could win. He worked his way through the remaining break-away riders then summited the pass and descended solo, coming to the line with a thirty-four second advantage over the ninteen man chase group that included Euser. Morton rode on Slipstream Sports’ development team from 2010 through 2012 before moving up to the World Tour outfit this year. The Australian’s talent impressed Garmin-Sharp’s Jonathan Vaughters significantly as much as five years ago when Morton would have been about sixteen. As he crossed the finished line the Australian pointed his right index finger skyward and held his left hand over his heart. A report on the team website indicated Morton had made a tribute to his grandfather. Even on the podium Morton’s eyes gazed up into the Utah sky. UnitedHealthcare’s Kiel Reijnen fought to close a thirty second gap to the chase group all the way up Nebo. Reijnen now holds twenty-first position on GC, three minutes back. He has sprinted well from the start of the event with the fastest guys in the field, placing fifth on both Stages 1 and 2. He’s ready to give it a go tomorrow in the Salt Lake City circuit race. That will be a day for Euser to stay out of trouble and keep his thoughts focused on that black hat.